The painting on the left is a 19th century fresco by Elias Garcia Martinez in a little church in Borja, Spain. What if I told you the painting on the right is the same painting after it was vandalized by a gang of hoologins on a mission to destroy all of Spain's religious art? It makes your blood boil doesn't it? What if I told you instead, that the painting on the right is a restoration attempt by an 81 year old woman named Cecilia Giménez who just wanted to help? She's a parishioner who lives next door to her church where this painting resided and she loved it. She watched it deteriorate over a period of many years until one day she decided to undertake the painting's restoration herself. She was persistent. At some point she realized the task was beyond her. She couldn't restore it to it's original beauty or bring it back to what it was before she started. She had to give up. Not only did she miss the mark on maintaining the way the painter subtly captures Christ's nobility and authentic humanity, she also has the scroll going the wrong way on the bottom, and the background is blue instead of yellow. The eyes no longer look toward the Father. They're looking at us like he's clever and bored with us but has something up his sleeve. Instead of a beard and crown of thorns, he's wearing a fuzzy cap that wraps under his chin. I won't even try to describe the nose or mouth. It makes me sad to look at it bit by bit in detail. She's retired to her house now, next to the church, bedridden from anxiety. I hope she recovers soon. If this painting was vandalized by hoologins, I'd be angry. Yet on some level, Cecilia Giménez has given me the best laugh I've had in a long time. Remembering this is a priceless work of art brings everything back into perspective and I start laughing again. Why is that? I couldn't tell you. However, I see a message here. I believe God is comforting this woman now and might be laughing with us. Some people are furious. However, I like to think God is less concerned with losing a picture of Jesus than he is with the heart of one woman who's walked with him these many years (perhaps imperfectly) who just wanted to help. She also might be part of a band of women at the church who run things who have the priest biting his tongue. I also wonder, when we rush forward independently, in our own self-directed efforts, to reflect Christ to the world, if we end up looking more like the Jesus on the right. Only God can love children like us. I wouldn't mind if they kept the painting as it is. Thank you Cecilia Giménez. You've given us a wonderful work of unintentional performance art and laughter. She has a following. 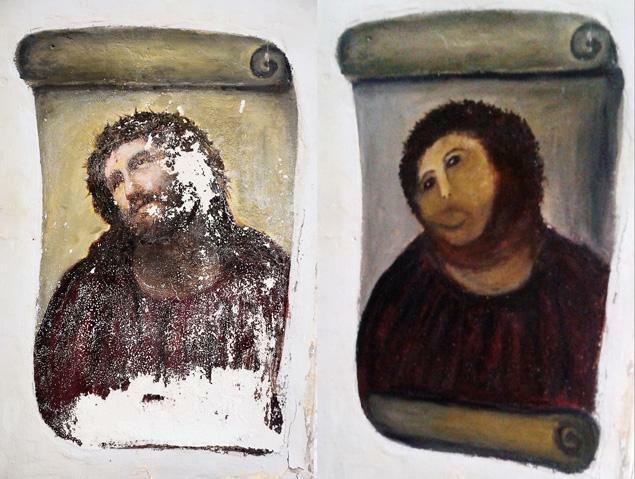 An artists rendition of how Miss Giménez' might paint The Last Supper and An artist's rendition of how Miss Giménez' might paint the Mona Lisa.